The official cast album of the smash hit musical comedy with 17 hilarious original songs. A Don't Hug Me Christmas Carol is the smash hit musical comedy spoof of Charles Dickens' classic story, A Christmas Carol. A Don't Hug Me Christmas Carol has played to critical acclaim and sold-out theatres all over the country. It's "Fargo" meets "Scrooge" (without the wood chipper or the Cratchits). A Don't Hug Me Christmas Carol is published by Samuel French and is the sequel to the award-winning smash hit musical comedy, Don't Hug Me. Synopsis: It's Christmas Eve in Bunyan Bay, Minnesota and cantankerous bar owner Gunner Johnson gets in an argument with his wife, Clara, tells her he’s skipping Christmas, he storms out of the bar, goes snowmobiling across the lake, falls through the ice on his skidoo and goes into a coma. He comes back in his dream where he's visited by folk legend, Sven Yorgensen, who plays the ghost of Christmas past, present, and future. Sven takes Gunner (Scrooge) on a journey similar to that in Charles Dickens’ "A Christmas Carol" only very different. Will Gunner come out of his coma and find redemption with Clara at The Bunyan? Find out. ● What Would Barbra Streisand Do? It’s Christmas year-round with this comedic collection of original holiday carols! Phil & Paul Olson’s “A Don’t Hug Me Christmas Carol” will have listeners laughing nonstop with hilarious tunes like “Its Christmas Time So Please Give Me Some”! Musically, these tunes radiate a delightful easy-listening vibe and deliver a delightful variety of instrumentation, sounds, and arrangements. “I Love You More Than Football” shows off this duo’s roll-on-the-floor funny lyrics and creative musical compositions. What’s more, Phil and Paul’s vocals are vibrant, full of personality, and fuse together to produce a dynamic twosome! Wrapped in beautiful production, this Christmas present is one that every holiday-addict should have! 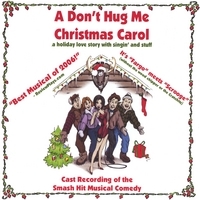 Fans of comedic holiday music will find laughter and endless entertainment in this hilarious CD!